While I love multipurpose beauty products, special hand and foot creams are necessary for me because sometimes you just need a little extra TLC in those areas. Hand cream is something I try to never be without, especially during cold, dry weather, as my skin is prone to the chapping, cracking and plain-ol’ irritation from both extreme conditions and overzealous hand washing. A new hand cream I’ve introduced to my winter skincare arsenal is Andalou Naturals Lavender Shea Hand Cream, a power-packed dream cream that boasts organic lavender and fair trade shea butter as its star ingredients. While shea and lavender are the highlighted ingredients in this soothing, smoothing hand cream, I get a little giddy seeing all the other beneficial ingredients Andalou Naturals was able to fit into this 3.5-ounce hand cream. Besides being impressed by the number of smart plant-based ingredients in Andalou Naturals Lavender Shea Hand Cream, I admire even more the fact that Andalou Naturals does its homework when it comes to ingredient sourcing; the entire line has been verified by the Non-GMO Project, which is an amazing feat for a green beauty brand (most brands just have a few products certified Non-GMO!). While I respect brands that go the extra mile to earn prominent certifications (USDA organic, Non-GMO, etc. ), it still comes down to “does this product do its job?” and I can say I have no real critiques of Andalou Naturals Lavender Shea Hand Cream. It’s thick and creamy but is fast-absorbing and not overly smelly (I used to hate lavender!). Andalou Naturals Lavender Shea Hand Cream is a seemingly simple hand cream that has a lot going for it, and at $8.95, it’s affordable and accessible via many retailers, including Whole Foods. But it really doesn’t stop there. 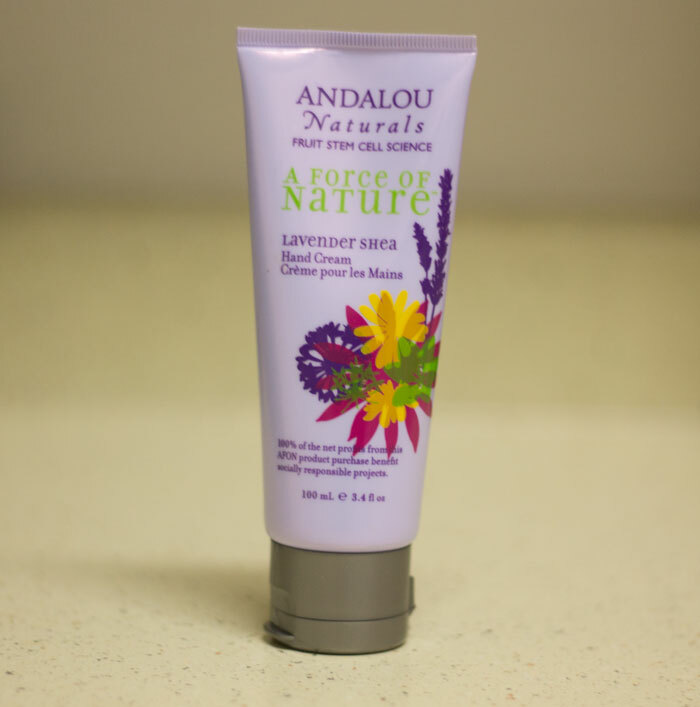 Your purchase of Andalou Naturals Lavender Shea Hand Cream benefits socially responsible organizations, as Andalou Naturals gives 100 percent of the net profits from this hand cream to organizations like these. I really can’t think of a better way to spend $8.95 — a hand cream that feels lovely, looks pretty, smells good and gives back on so many levels. Have you tried anything from Andalou Naturals? What factors do you consider when making green beauty purchases — charity, certifications, ingredient sourcing — tell me in the comments section!